After public outcry in the area, Amazon is pulling out of the New York location. 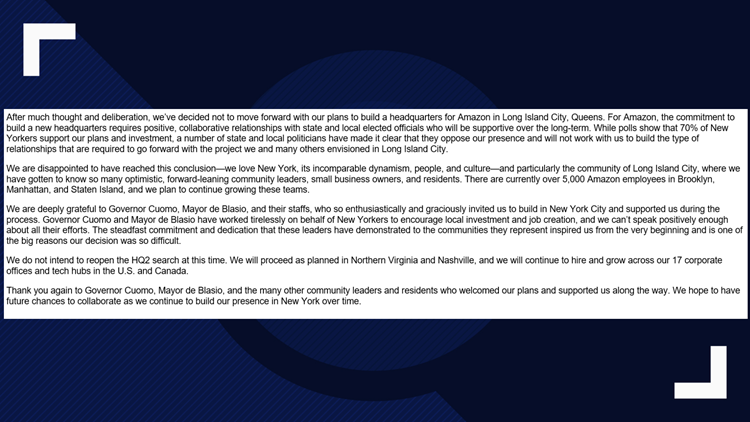 WASHINGTON — After public outcry, Amazon announced Thursday plans to pull out of the company's planned "HQ2" in the New York area. "After much thought and deliberation, we’ve decided not to move forward with our plans to build a headquarters for Amazon in Long Island City, Queens," the company said in a release. " For Amazon, the commitment to build a new headquarters requires positive, collaborative relationships with state and local elected officials who will be supportive over the long-term." RELATED: Amazon's HQ2 is officially coming. What's it going to do to your rent? Your home value? RELATED: What are the Amazon jobs coming to DC and what will they pay? The company had faced some local opposition due to the tax incentives Amazon was promised. Amazon officials said their other plans for Northern Virginia and Nashville will "proceed as planned." They said in a release they did not intend to reopen the search for "HQ2." In November, Amazon announced it would split its second headquarters between Arlington, Virginia and Queens in New York City. The company also released what incentives it would be receiving from each. The incentives includes performance-based direct incentives of $573 million based on creating 25,000 jobs in Arlington; and performance-based direct incentives of $1.5 billion based on creating 25,000 jobs in Long Island City. RELATED: Should Amazon ask Virginia to change the name of Jefferson Davis Highway in Crystal City? 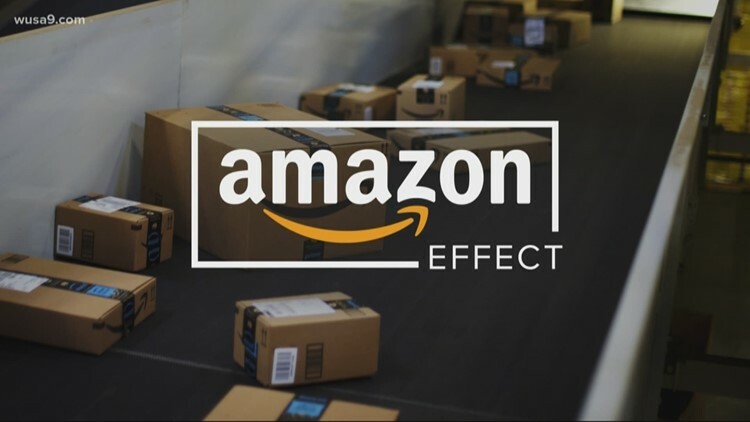 Read more about more about the Amazon Effect here.